Despite an initially unsuccessful application to the Victorian College of the Arts, Gabriel Hutchings persevered. Now a Bachelor of Fine Arts (Film and Television) student, he shares some of the joys and challenges of his filmmaking journey so far. I knew the VCA was the right place for me when I came across the 2013 graduate screening trailer. It was set to this lovely melodic music and there were a bunch of images that jumped out at me, like a man sitting on a white horse in someone’s bedroom. In the last ten seconds the trailer takes a really dark turn and the music becomes abrasively distorted industrial percussion. I remember thinking, ‘Any course that cuts their promotional material like that is for me’. Film should make you feel something. It should be compelling, not just pretty images. The first year I applied for the course I didn’t get in. I’d spent a year travelling after high school and then started a film course in Perth, but I realised pretty soon that it wasn’t what I was looking for. I decided to move to Melbourne with the hope of getting into the Bachelor of Fine Arts (Film and Television) at VCA, but when I didn’t get in I ended up doing the VCA Foundations course instead. That year turned out to be super valuable: I met a lot of people that I still work with, did as much crewing as I could, and got some great on-set experience. I got into the Bachelor of Fine Arts (Film and Television) the second time. Filmmaking is a challenge in almost every way. It takes a lot of people, time and resources to make a film and it’s a very personal and exposing process. But it’s also an incredibly collaborative and rewarding art form. All of the challenges along the way are what you learn from and how you develop. One of the most rewarding parts of the course is seeing the films screened to an audience. You know the work and effort that has gone into all of them and often you are involved in many of the projects in various crew roles. It’s great to see what you and your classmates are capable of up on a screen in front of an audience. Gabriel Hutchings on the set for his short film Harvest (2015). I’m influenced a lot by music and images. The mood and textures of photographs can be great references for a visual medium like film. Inspiration comes from everywhere. For me it’s more about filtering it down and trying to distill my own style. It’s about discovering what will help me to tell the stories I’m interested in. Over the past few years my focus has shifted from directing to cinematography. I’ll finish my degree at the end of this year, and moving into the industry I want to continue developing my knowledge shooting as much as I can. My goal is to be making a living shooting stories I’m passionate about with good people. To anybody out there who wants to be a filmmaker I’d say: hustle and keep producing work. It can be frustrating seeing the divide between the work you like and what you’re able to create yourself but the more you do it the more that divide gradually closes. If you want to be a director, direct as much as you can on any level. If you want to be a cinematographer, shoot as much as you can. Along the way you learn a lot from the theory and study that feeds into your work, but the best way to get better at making film is by making films. Go out and do it. Lead image: Bachelor of Fine Arts (Film and Television) student Gabriel Hutchings in the VCA Film and Television studios. Image by Sav Schulman. 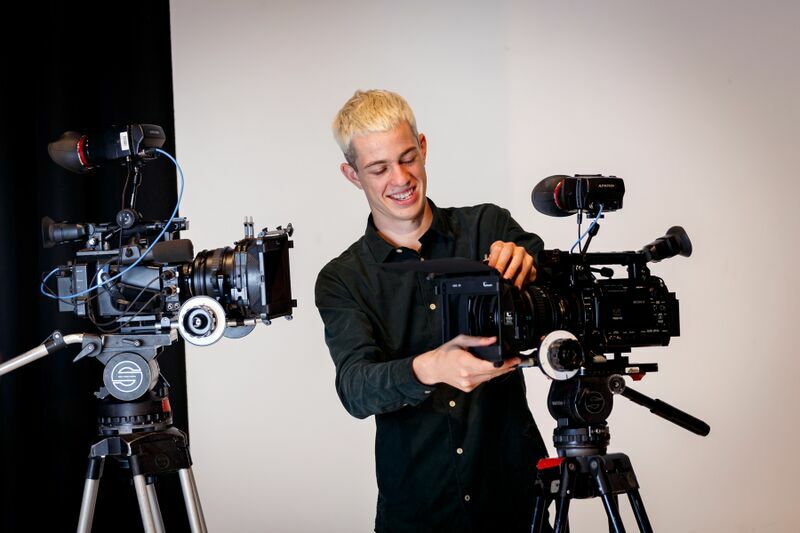 Find out more about the Bachelor of Arts (Film & Television). Find out more about our Film and Television Foundations course.